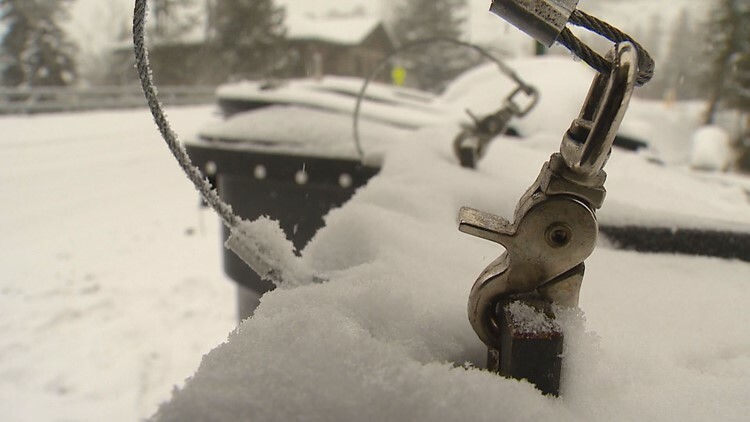 A Steamboat Springs welder has built a steel device that fits onto trash cans and keeps bears from getting into them. Steamboat Springs — A man living in Steamboat Springs promises his product can keep bears out of your trash can. Rollin Stone owns RS Welding and Fabrication and works around Steamboat Springs, but most recently he’s been working hard to make a name for himself as an inventor. For the past few years, he’s been building and designing a new way to keep bears out of trash cans. The device uses a reinforced steel frame that Stone said fits onto the top of most plastic roller trash cans – the kind people roll from their garage to the street. There are two clips that keep everything locked up and prevents bears from getting inside. The device has already been tested on grizzly bears in Montana at the Grizzly Wolf Discovery Center, and for the past few years he’s been testing them against bears around Steamboat. “I have gotten reviews from people who told me a bear threw their can around for two hours and then took the walk of shame afterward,” Stone said. Now he’s got a patent for his invention and is selling it. They cost about $195.00 and need to be installed onto the right kind of trash can, but Stone said the device will help save bears by keeping them out of trash. “It’s great to have something that is very simple yet very effective in the community for the bear problem we are having,” Stone said. You can contact Stone on Facebook on his RS Welding and Fabrication Facebook page.